Another trip to the nursery, another batch of plants taken home with me. We already have the green velvet boxwoods and francee hostas for the front. 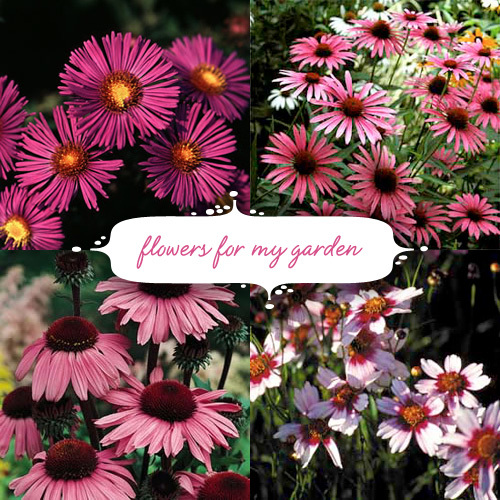 And now we’ll have (clockwise from top left) purple dome asters, pixie meadowbrite coneflowers, ruby star coneflowers, and sweet dreams coreopsis. They’re all at varying heights, from 15″ to 36″. I still have to (re)prepare the side garden before I can plant them. I feel like I have a direction now, but I’m not so sure about the burning bush and the crimson pygmy barberry bushes that I’ve put out there. They don’t really go together. I also put a cistena plum out front because I thought it was going to be more tree-like and less bushy (because I thought I saw the same plants in neighboring lawns). I think I’m wrong. I wonder if I could move them? I think Brandon would be mad if I just got rid of them (money wasted). Eeesh. Those are all really lovely bushes. I love ’em. Our neighbors lost a tree this weekend and I was 1)grateful it wasn’t us because it was $1500 to remove and 2)devastated because I lost all my shade. Hope my garden does ok with it. love all the flowers. as for the green velvet boxwoods, i just pulled up 2 of these because i dont like them. in their place a crate and myrtle and rose bush. but to each their own! if you’re going to try to dig up your plants and move them, dig a lot wider and deeper than you think you need to go. Dig a trench around the outside of your plant first, and fill it with water. Then carefully dig up the plant. Transfer it to wet hessian (if possible) to stop it from losing dirt, and transfer it in a wheelbarrow. You can bury it with the hessian, if you like, as it will bio-degrade. I’ve never done it myself, but I saw it on Gardening Australia – can’t find a factsheet for you though, sorry! The perennials all look really nice together! You’ll have lots of pink in the summer. Might want to add a few plants that flower earlier in the spring so you’ll have color then, too. Yea to Jessica! Boo boo to Barberry! Scroll to the bottom of the page for some great alternatives. Great choices! Give the cistena plum a chance. They start out bushy but over time may be pruned into a lovely little tree. I, too, am not a big fan of barberry but our burning bushes (zone 5, northern Colorado) are absolutely breathtaking in autumn (but definitely NOT pink – very, very RED). I also like the foliage during the rest of the year. Have you thought about vines on your porch posts? I love the foliage on hardy kiwi (Actinidia kolomikta ‘Arctic Beauty’ z5-9) – it’s green with pink and white variegation. I am horrible in the garden, so I think what you are doing is amazing. I love all the stuff that you’ve picked out so far. I can’t wait to see photos when you are done! Oh, I love all that pink!! I picked coreopsis and coneflower for my side gardens, too, because they are supposed to be so easy and tend to spread and fill in. Plus, I love the daisy form of the flowers. I want some fall-blooming mums to go in there, too, but holy crap I’ve already spent a lot of money on plants this year…. if you are still looking for stuff though, Bluestone Perennials has a lot of stuff on sale right now, the plants I got from them look great. Great choices and it looks like you are a real pro. I love the purple coneflowers. Did you incorporate your metal sphere in the garden? I have one sitting in a birdbath entwined with grapevine, and I love the simplicity of it. No sphere yet – shipping would cost just as much, or more, as the sphere itself. You might also have fun with Cosmos… there are some pink cosmos that would go with the look of your other flowers, and they are an inexpensive, readily-available seed. Heck, I might have some in the cabinet from last season! I’ll dig around when I get home tonight. But they are a “sow-and-forget” plant… throw them out in the dirt and they’ll do a surprising job of coming up and blooming right through the season. I’ve mixed some chocolate cosmos (deep velvety brown and they really, truly smell like chocolate) in with my coneflowers and they look amazing in late summer. I’ve heard the phrase “burlap sack” on US tv/movies, and figured that it was hessian-like, but didn’t realise they were one and the same – or that you guys in the US didn’t use “hessian”. These are beautiful! What software did you use to create the group of four photos with the bubble dialog box in the middle?